Howard Chandler Christy's painting of the signing of the United States Constitution was commissioned in 1939 as part of the congressional observance of the Constitution's sesquicentennial. Completed in 1940, the 20-by-30-foot framed oil-on-canvas scene is among the best known images in the United States Capitol. It is on display in the east grand stairway of the House wing. The painting depicts Independence Hall in Philadelphia on September 17, 1787. George Washington is the most prominent figure; he stands on the platform next to Richard Spaight of North Carolina, who is signing the document. Eighty-one-year-old Benjamin Franklin is seated in the center, with Alexander Hamilton leaning toward him, while James Madison appears farther to the right. In comparison to many of the historical paintings in the Capitol, the colors are bright and airy, and the brushwork is almost impressionistic in places. Christy used light and shadow to unify the individual portraits. To achieve the greatest possible accuracy, Christy searched for portraits by the best artists of the late 18th and early 19th centuries, such as Charles Willson Peale and Gilbert Stuart. He located portraits of 37 out of the 39 delegates and the Secretary, William Jackson. Christy took some liberties in composing his scene: John Dickinson, whose signature was added by proxy, is included, and three men who were present but did not sign are not shown. He obscured the faces of the two signers (Thomas FitzSimons and Jacob Broom) of whom no portraits were found. He also researched authentic costumes, including a pair of George Washington’s breeches borrowed from the Smithsonian Institution, and he depicted the furniture and artifacts used by the delegates. The books beside Franklin’s chair were part of Thomas Jefferson’s library; Christy borrowed them from the Rare Book Room of the Library of Congress and included them in the scene to acknowledge Jefferson’s importance to the Constitution. He made the sketch for the painting in Independence Hall in September, at the same time of day as the signing, to show accurately the angle of sunlight in the room with its glass chandelier. The artist said that the flags he depicted are the Stars and Stripes, one from a Maryland dragoon regiment, and regimental colors from Massachusetts and New Hampshire. Representative Sol Bloom, the director general of the United States Constitution Sesquicentennial Commission, first proposed that the painting be commissioned in 1937 as part of the 150th anniversary of the Constitution. Howard Chandler Christy, one of the most popular illustrators and portrait painters of the time, had created a historically accurate scene of the signing for the Commission to reproduce. His first small painting included a maiden representing "We the People" and numerous other symbolic figures, but these were eliminated in the final version. 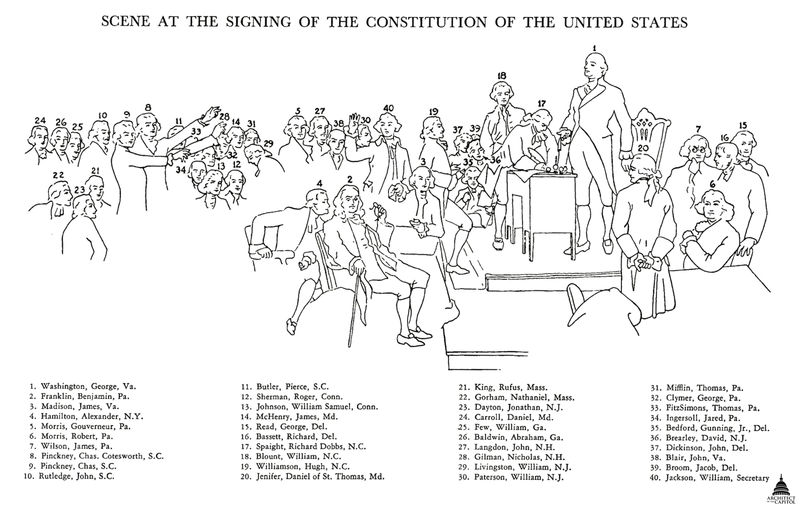 In the three years during which Representative Bloom worked with Christy to locate early portraits of the signers and to fill in historical details, he became aware that there was no scene of the signing of the Constitution in the U.S. Capitol, and few other paintings in existence included all the signers. A Joint Resolution was first introduced in the House in 1937 to pay Christy $35,000 to paint Signing of the Constitution. Heated debate arose, however: some members of Congress were in favor of memorializing one of the greatest events in American history, but others held deep reservations about spending the funds for art during a period of severe economic depression, and the bill did not pass. The Joint Resolution failed again in 1938. Finally, in 1939, a modified resolution, P.R. 11, 76th Congress, was accepted to set up a commission consisting of the Vice President, the Speaker of the House, and the Architect of the Capitol to employ an artist to paint a 20-by-30-foot scene of the signing at a price of $30,000. The contract with Christy was signed on July 24, 1939. On October 29, 1940, Congress approved $1,500 for the purchase of a frame, which was accepted by the Joint Committee on the Library on December 26, 1940. The huge 18-by-26-foot canvas was painted in the sail loft of the Washington Navy Yard, where Christy at times used enlisted men as models for the figures. After five years of research and seven months of painting, the canvas was dedicated in May 1940 in the Rotunda of the Capitol, where it was on view for 16 months. The 20-by-30-foot frame, made in nine sections including the central eagle and crest, was hand carved and given a gold-leaf finish by Azeglio Pancani of New York. After much debate about where it could be hung, another painting was moved and the Christy in its frame was installed in the east grand stairway of the House, where it remains today. In 1967 the painting was vandalized by being slashed along the bottom; the canvas had to be removed from the stretcher to be transported for repair in 1968. The fills made then were apparent, however, and over time dust, grime and yellowed varnish obscured the original brilliant colors. In 2006 the painting was cleaned and conserved in place by conservators working from a large four-level scaffold from mid-October through December. The cleaning of areas that had looked dull brown revealed lively expressions; detailed costumes; and impressionist colors, such as lavender and pink, applied with scintillating brushwork. The vandalized area was given special attention and is now barely visible. Finally, a new coating of clear protective varnish was applied. The frame, which had been covered with bronze powder paint in 1968, was taken apart in sections and conserved off site. It was cleaned and repaired, regilded with 22-karat gold leaf similar to the color of the original metal leaf, and toned to complement the painting. The gold leaf will never tarnish and should remain beautiful for generations to come.